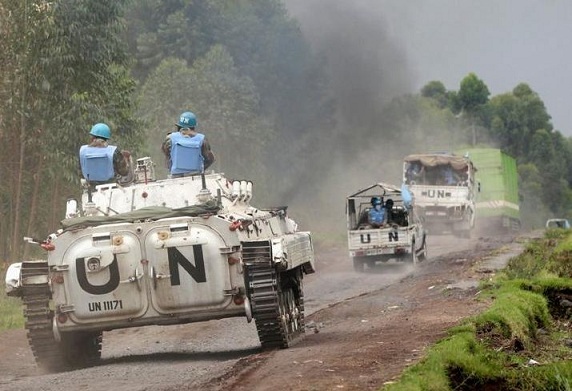 Home Africa Live Gunmen open fire on U.N. base in C.A.R. Gunmen open fire on U.N. base in C.A.R. Unidentified gunmen on Sunday opened fire on a United Nations base in the Central African Republic’s capital, escalating events that saw at least one civilian killed and dozens of people injured, a U.N. spokesman said. The gunmen fired on a section of the base that houses Egyptian and Jordanian peacekeepers at about 2200GMT, sparking a 30-minute gunfight in which no one was killed or injured. “We returned fire and sent reinforcements, and calm returned after half an hour,” Reuters quotes a U.N. spokesman Vladimir Monteiro to have said. The C.A.R. has been dogged by conflict since 2013, as rebel Muslim militia fought rebel Christian fighters. A UN peacekeeping mission in the country (MINUSCA) has struggled to restore peace since then.